- Measures: Width: 323 cm Depth: 105 cm Height: 260 cm Weight: 1900 kg - 2 year Guarantee! - Free Shipping! 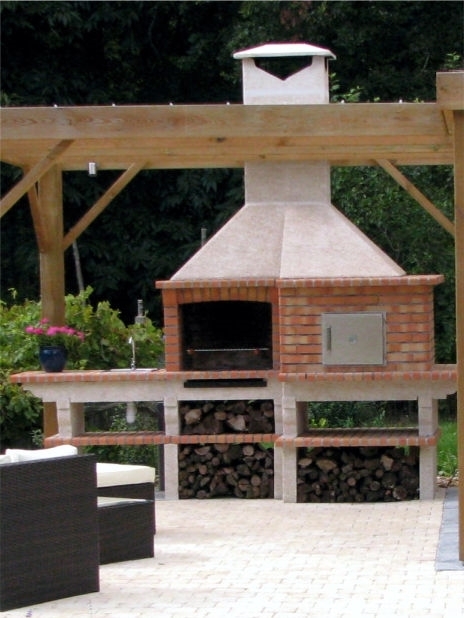 Brick Barbecue and Oven AV350B Free shipping to England, metropolitan France*, Monaco, Belgium, Luxembourg, Italy and Spain. For other destinations please contact us. Combine ingredients and puree them in a blender or food processor. This should make approximately 2 cups of chimichurri. Set aside 1 cup to serve with the cooked ribs, and use the remaining cup to marinate the ribs. Make sure they are well covered and refrigerate overnight. When you are about to cook, take the ribs out of the refrigerator and season them with black pepper, and let them reach room temperature while you prepare your Heat Beads coals. When the coals are ready, place the ribs on the hottest part of the grill and sear them on one side until they are nicely browned. Turn and baste the ribs with the brine and grill until the other side is browned too. Then move the ribs to a cooler part of the grill and continue to turn and baste the ribs frequently until they are done. This should take 16-20 minutes.